2. Chequered Surface (possible in case of only covered gratings). Surface appearance shall be similar as that in MS chequered plates. Weight 16kg, 18kg & 21kg respectively. 2000 Kgs per sqm UDL, 4000 Kgs per sqm UDL & 6000 Kgs per sqm UDL respectively. Bar thickness 20 mm at corners. 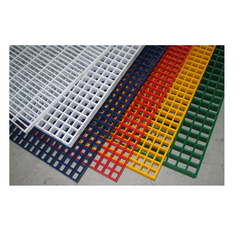 500 Kgs per sqm UDL, 900 Kgs per sqm UDL & 1.3 T per sqm UDL respectively.